JAZZART is alive and well. Doug Wicken & JAZZART-2, a duo featuring double bassist Doug Wicken and pianist Ralph Hetke forms the nucleus, with a focus on accessible easy listening jazz for intimate venues like cafés and dining establishments. With the addition of a drummer, JAZZART-3, becomes a trio, and with a horn, JAZZART-4, is ideal for larger venues like clubs and festivals. For several years from the mid-’70s to the mid-’80s, most of my jazz activity was performed under the all-encompassing name, JAZZART. I chose this name over using my own name, followed by the size of the group (trio, quartet, etc.). Many different musicians played in one version of JAZZART or another. My current recollection (30+ years later) of the ever-changing personnel includes: Barry Wills, Bernie Carroll, Mike Pihura, Ralph Hetke, Evan Graham, Larry Crawford, Dave Miller, Dave Finn, Brian Tansley, and Dave Wiffen. The only apparent consistency was that I played bass, although it might have been a double bass or a Fender Fretless, depending upon the date and the groove of the music. JAZZART groups ranged in size from duos to sextets, and the personnel changes reflected the availability of musicians as gigs became available. Occasionally Barry Wills was travelling, Bernie Carroll was on the road, Brian Tansley was in K-W for a short period of time before moving to Ottawa, Miller and Finn went off to Berklee for a while, and Dave Wiffen showed up near the end of the decade to work with us at The Olde English Parlour before he headed off to study at Eastman in Rochester. The Olde English Parlour marked the final gig for JAZZART, ending in May 1986, and my involvement was interrupted by my activity as a documentary photographer and a subsequent offer of a teaching position in Belleville, Ontario that removed me from K-W for 28 years. Here are two more photos from the University of Waterloo 1965 concert. The quintet personnel (l to r): Doug Wicken (bass); Joe Lucchetta (guitar); Jack Kaplun (drums); Paul Cross (alto sax); Clarence Brodhagen (trumpet). 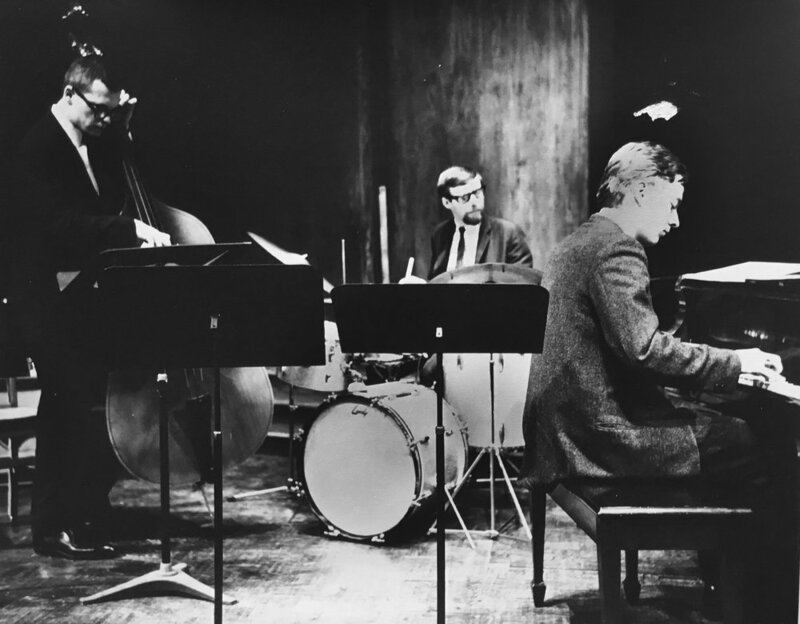 The trio photo (below) shows Wicken, Kaplun, and Bill Metcalf (piano). I believe that the photos were taken by Don Cooper, who lived in Guelph, ON. It occurred on Sunday, January 10, 1965; the first jazz concert performance under my own name. The Doug Wicken Quintet appeared on the stage of the University of Waterloo’s Theatre of the Arts. 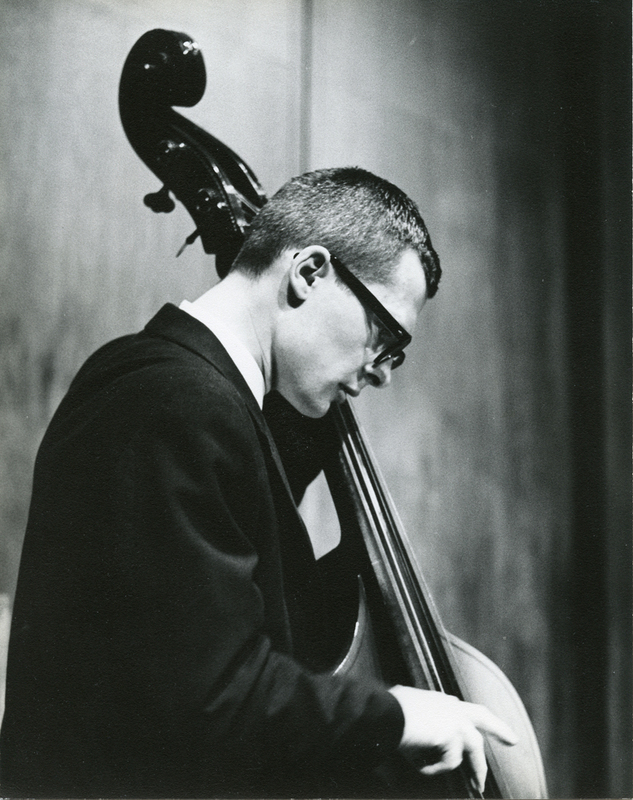 I was 22 years old, a mere child, and had been playing the double bass for 18 months. Appearing with me were Paul Cross (alto sax); Clarence Brodhagen (trumpet); Joe Lucchetta (guitar); and Jack Kaplun (drums). Pianist Bill Metcalf also joined Jack and I for several tunes as a trio. We played Berklee College charts, which I had scored for our instrumentation; I was enrolled in a Berklee correspondence course for arranging and orchestration at the time. The Bernie Carroll Trio, with Barry Wills (piano), Art Lang (bass), and Bernie on drums, preceded our performance. It was also Bernie’s first jazz concert under his name. Ironically, a year later, The Barry Wills Trio was formed that ultimately brought Barry, Bernie and I together for what became a long-lasting musical association and friendship. Jim Smith (R) shows me where he repaired some of the damage. This past winter has been brutal for my prized hand-carved double bass. The severe lack of humidity in my apartment took its toll, causing several cracks to emerge in the front of the bass and separating portions of the back from the sides. Major surgery was required. Fortunately, there’s James Smith, an experienced and talented luthier living in Prince Edward County. Jim has been a friend of mine, and of my bass, since I started building it in 2001. He knows my instrument inside and out and has come to its rescue on several occasions. Yesterday, I drove to The County where my bass was being released from Jim’s workshop; it’s more like an operating room where precious friends are brought back to life. Once again, Jim (the surgeon) accomplished miracles. I’ve spent today woodshedding with my trusted musical sidekick. It’s great to have her back. Hi Friends. I must be the world's worst Blogger. More than a year has passed since my last post. I'll try to do better this year. I'll be performing again with The Bernie Carroll Project on Friday, June 8, 2018 at The Jazz Room in The Huether Hotel, King Street, Waterloo. On so many occasions I've heard from musicians, both local and from abroad, that The Jazz Room is their jazz club of choice. There are many reasons that The Jazz Room has earned this reputation. First and foremost is that it is a LISTENING club; no idle chatter is permitted during the performances. This is not only because it's polite for the musicians (which it is), but it also allows other listeners to really hear what's going on. Jazz is not only loud and percussive, but is often subtle and quiet. Jazz is also comprised of sound and silence, and both must be appreciated. The second and subsequent reasons are related to how the musicians are treated by the management and the volunteers who keep the club going week after week. There is a designated sound person who looks after setting up all the microphones, the speakers, and particularly, the monitors which allow each musician to hear what's going on. Many non-musicians don't understand how difficult it can be for the musicians to hear each other on the bandstand. Jazz is a listening art. A great jazz performance depends upon how attentive the musicians listen to, and respond to, each other. Sound checks are usually conducted in the late afternoon before the performance. The musicians use that time to run over some of their material while the sound person adjusts and balances each instrument. Each performance is recorded by the sound person, and the recordings are made available to the musicians as desired. The musicians are fed from The Jazz Room menu between the sound check and the start of the performance. Photos are often taken of each performance, and within a few days, digital images magically appear in each musicians email. Some of the images used in my website and on my Facebook page are from those files, with full permission to reproduce them. Now. Ask me why I look forward to performing at The Jazz Room. Did I mention that the musicians are also paid respectably? The Bernie Carroll Project includes: Dave Wiffen (tenor sax); Doug Wicken (flute); Ralph Hetke (piano); Al Richardson (bass); and Bernie Carroll (drums). You can hear selected recordings of this band in the Sounds and Samples page of my website. www.dougwicken.net . For those who have known me as a jazz bassist for many years, it might have been a shock to see my new home page photo. For the record, I’ve been doubling on flute for the past 13 years, but it has never been my prime instrument; until now that is. During 2016, I began taking flute lessons again, this time with Wendy Waglar at Renaissance School of the Arts in Waterloo, which has allowed me to experience a new excitement for the instrument. I’m now expanding my musical interests to encompass both jazz and classical, and my repertoire will gradually reflect this. There will also be occasions (through my other passion as a composer) to blend the genres and soften the boundaries between them. My debut jazz appearance on the flute will occur on Thursday, February 9, 2017, at The Registry Theatre in Kitchener, when I’ll be performing with The Bernie Carroll Project as the opening show of the Winter Jazz Festival. The quintet will include Al Richardson (replacing me on bass), Ralph Hetke (piano), Dave Wiffen (tenor sax), and, of course, my lifelong musical comrade, Bernie Carroll (drums). Many of you will recall The Project’s performance last February at The Jazz Room. You will also recall that there was a sell out crowd and the room was charged by the energy and momentum of the band. You won’t want to miss our Registry appearance this year. I’ll be posting more about the concert as the date draws near. In the meantime, Happy New Year to you all. New recordings in the Sounds and Samples Listing. I've added a couple of new recordings from The Bernie Carroll Project gig in February at The Jazz Room. Give them a listen. I’ll be back at The Jazz Room in Waterloo on Friday, April 8, when I play bass with The Andy Klaehn Group. Performance is from 8:30 to 11:30 p.m. and admission is $15.00 at the door. The Jazz Room is located in the historic Huether Hotel, 59 King St. North, Waterloo, Ontario. I hope to see you there. Don’t miss the The Bernie Carroll Project at The Jazz Room in Waterloo on Sunday, February 21st, from 4:00 to 7:00 p.m. The Jazz Room at Waterloo’s Huether Hotel is one of the finest jazz venues in the country. I’ll be playing bass with Bernie Carroll, an old friend of more than 50 years, back when we were two-thirds of The Barry Wills Trio. I’ve been back in Kitchener-Waterloo for eight months and I’m definitely looking forward to this concert with some of the area’s great musicians: Dave Wiffen (tenor sax), Dave Thompson (guitar), Ralph Hetke (piano), and of course, Bernie Carroll on drums. We’ve put together an energy-driven program of jazz standards along with original compositions. This is not to be missed. Advance tickets have been selling already. Contact The Jazz Room, http://www.kwjazzroom.com/ for more information. Tickets are $15.00. Well, here I am, back in Kitchener-Waterloo. I’ve already heard from so many old friends and have made some new ones in the process. My first gig was within five days of my arrival, a Friday night appearance at The Jazz Room in Waterloo, which I’m told, is the area’s hottest jazz venue. It was certainly hot on Friday night. I played with Andy Klaehn and his quintet, and had the opportunity to work with guitarist Keith Murch, drummer Andy Macpherson and pianist John Zadro. It was a wonderful evening with a full house audience, a listening audience at that. There’s not much more to say at this point, except that it’s great to be back. After living and working in the Quinte area of Eastern Ontario (Belleville and Picton) for the past 27 years, I am returning to the once-very-familiar territory of Kitchener-Waterloo in June. It will be an opportunity for me to reconnect with family and old friends whom I have gradually lost touch with through time and circumstances. During recent trips to K-W in search of some roots and an apartment to live in, I have been amazed, not only at how the area has changed, but also how much of it remains familiar. A walk through Waterloo Park two weeks ago, where I once trekked daily on my way to work at the University of Waterloo, revealed the same animal compounds (different animals), the familiar rippling brook flowing beneath the footbridge (new bridge), the band shell (where I used to perform jazz on Sunday afternoons), and the “breaker-breaker” calls of scarlet cardinals. I’m not naïve. I fully realize that one cannot go home again in the sense that everything will remain as memory dictates. Many changes have occurred. Downtown Waterloo is now Uptown Waterloo. Seagram’s and Labatt’s are gone and with them, the essence of distilling and brewing that once wafted along Caroline Street and down Dorset past our previous home on Spring Street. There are new and rejuvenated homes, museums, theatres, cafes, and galleries, and the library has been enlarged and modernized. Both universities have overflowed their previous boundaries and spread their presence into every nook and cranny of the city. Those revelations represent only my renewed experiences within Waterloo. Kitchener remains yet to be rediscovered. It is not the past that I’m seeking in K-W, but the present. I won’t even attempt to imagine the future at this moment; it pretty much takes care of itself. Following moving day, I’ll be searching for old friends and creating new ones. Music, photography and writing (my three amigos) will draw me through alleyways and into bookstores, clubs, concerts, festivals, parks, the corridors of both universities, and anywhere else where people are interesting. Perhaps we’ll meet somewhere soon. As a photography student in the early 1970s, I was able to supplement my income by playing the bass on gigs around the Kitchener-Waterloo area. I accepted any genre of gig that came along, from lounges to weddings, from Oktoberfest gigs to Christmas parties, from concerts in the park to playing for the Ice Capades and the Lipizzaner Stallions at the arena, all for the almighty buck. I knew all along that, as soon as I was finished college, I would edit my gigs down to only those I felt strongly about, mainly jazz and other interesting challenges. Upon graduation I started to work at the University of Waterloo. I gradually narrowed my musical focus into jazz, and began working on personal documentary photography projects. Together, they shaped my life to come. Over the next 40 years, there were times when music held my attention more than photography, and vice versa. There were also moments when they competed for my attention at the same time. It was the best of times and the worst of times, but it was the way it was. In more recent years, especially since I retired from the college, I have focused more of my energy into jazz performance and composition. I can however, feel the claws of photography pulling me in its direction, with my thoughts gathering towards a new documentary project. There’ll be more on that in a future posting. Recently, while discussing the design of this website with several of my friends, the subject of specialization once again arose. Should I have a specific web presence for my music, and another for my photography? One advocate for the music-specific version stated that it would be too confusing for the viewer if I displayed and promoted multiple interests. Another encouraged me to put all my passions together. “Let people see who you really are,” he said. I opted for the latter, partly because it would be less expensive, but also so I could express my passions together. I firmly believe that each of us is the culmination of all our things. My energy is spent on music and photography; together they form who I am. To me, they are one, all contributing to the path I’ve created for myself. While I was teaching photojournalism at Loyalist College, I constantly encouraged students to be passionate about more than one thing, and to determine for one’s self, the life ahead. Life isn’t about following; it’s about carving one’s own path through it. The old adages, “You only live once,” and “You only travel this road once in one direction,” are absolute truths. This concept can be a huge struggle for younger people to comprehend, especially those with only 20 years behind them and 70 ahead, but it makes much more sense to people for whom the numbers are reversed. Finally, I’m able to compose my first blog, after spending most of my time organizing the other material for the website. I often catch myself relating to someone, usually younger than I, the details of some memorable event in my life. Events that come to mind as I write are: catching Miles Davis and his quintet playing live at the Colonial Tavern in Toronto (1969); playing bass at the Kress Hotel in September, 1981, with the John Tank Quartet; performing “Song for Dave Drew,” a tribute co-composed in 1975 by Barry Wills and myself to our good friend Dave, who had recently passed away; a memorable night in late-1964, after sitting in with Trev Bennett’s band. It was during the latter event when Trev’s pianist, Barry Wills, turned to me and asked whether I was working with anybody on a steady basis. When I answered, “No,” he asked if I could recommend a drummer for our new trio. After a couple of beers, the Barry Wills Trio was formed, with Dave Graziotto as the drummer. In time, Dave left and Bernie Carroll joined us. Interestingly, Barry was also in attendance on most of my other memorable occasions. While enroute to Toronto to hear Miles play, we were pumped up with anticipations about who would be on piano, or on bass. I was hoping to see my former workshop teacher, Ron Carter, and Barry was anticipating Herbie Hancock. And of course, we all wanted to hear Tony Williams, the great young drummer. None of the above happened. What did happen was an event that remains to this day, the finest jazz influence on my 50 years of playing the bass (and I don’t like using superlatives). After Jack DeJohnette stepped onto the stage to tune his drums, bassist Dave Holland joined him to do the same. Chick Corea explored the Fender Rhodes while Wayne Shorter ran arpeggios through the entire range of his tenor sax. Soon, the cacophony of tuning up evolved into a cohesive burst of energy, soon joined by the master himself, Miles. For the best part of two hours, the music soared relentlessly throughout the club and probed inside of each of us. Life changed that night for Barry and I. Many gigs that musicians play are forgettable. Bill Evans once said that only one in ten proves to be a memorable experience. I wish I could be that fortunate. There are however, a few that stand out. On a Thursday night in September 1981, John Tank, Dave Lewis, Barry Wills, and I gathered at the Kress Hotel in Cambridge for a gig. There was no time for rehearsal; John had just blown in from New York, and Dave had just completed a rigorous stint at the CNE as Rompin’ Ronnie Hawkins’ drummer. Why I brought my Hitachi ‘ghetto blaster,’ I have no idea. But I set it up on ‘auto’ across the room from the stage and ran 90-minute tapes for the duration of the gig. I still consume that recording to this day with awe at the energy and talent that we four young musicians produced there, at that moment in our personal music history. The piano, unfortunately, was under-recorded. But there is one take where Barry assumed the lead that produced one of the nicest examples of his wonderful playing. The recording of “There is No Greater Love,” 13 minutes in length, is included on the “Sounds and Samples” page of my website. I invite you to experience it. Barry counts it in; the laughter is Dave Lewis’. Memories! I’ve been told that I am blessed with the gift of a good memory; that I can easily recall events from the deepest crevices of the past. Alas, Barry did not share that talent. Instead, he had a talent for giving us these wonderful moments to remember. If we ever have a chance to sit over a coffee somewhere, ask me for a memory. Hopefully, my gift will still be available. Whenever Barry was called upon to introduce the next tune, he would pace the stage with his hands in his pockets, and explain some anecdotal piece of information, until his hands would come together in front of him, as if to warm them, and say, “Let’s let the music speak for itself.” There is a tune in my personal 'Tunebook' that I wrote the night Barry called me to inform me of his illness. He expressed his anxieties and fears about the future. I suggested that he might let the music speak for itself. One of these days I will record, "The Music Speaks." Welcome to my new website. Postings will begin soon.